If you rode the New York City subway’s Flushing-bound Number 7 Line before 2013, you probably recall the elevated train snaking through 5Pointz, a group of Long Island City warehouses emblazoned with colorful graffiti. After years of protracted litigation, a trial is now underway in Brooklyn federal district court that will determine whether federal law affords the artists who created 5Pointz a legal right to the graffiti. As we have chronicled on this blog, the site’s owners painted over more than 350 works of graffiti art comprising 5Pointz in 2013 as part of the area’s transformation into a residential development. 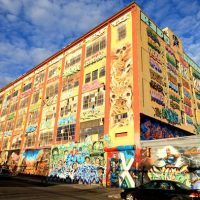 A group of 5Pointz artists had sued one of the property owners to prevent the site’s destruction, but the court sided with the property owners. In declining to enjoin the whitewashing of the graffiti, the court ruled that the 5Pointz artists failed to demonstrate that they would suffer irreparable harm if the works were destroyed. Among other reasons, the court noted that money damages could sufficiently compensate the artists if the graffiti were whitewashed. The trial centers on whether the Visual Artists Rights Act (“VARA”) protects the plaintiffs’ aerosol creations. Congress enacted VARA in 1990 to afford visual artists two so-called “moral rights” under then-existing copyright law: the rights of attribution and integrity. Among other things, an artist’s right of attribution allows her to be recognized by name as the author of her work, while her right of integrity allows her to prevent any deforming or mutilating changes to her work. Critically for the 5Pointz plaintiffs, VARA also affords a visual artist the right to prevent the destruction of her work—but only if the work is of “recognized stature.” See 17 U.S.C. § 106A(a)(3)(B). Whether the 5Pointz graffiti art had the requisite recognized stature to warrant VARA protection is the dispositive question. If the jury finds that the works possessed such stature, then the plaintiffs will be entitled to an award of money damages. As we have discussed, however, VARA does not define the term “recognized stature," and the meaning of that term has rarely been litigated. The 5Pointz artists will attempt to establish the recognized stature of their works through the testimony of expert witnesses drawn from the artistic community. Indeed, an earlier version of VARA provided that, in determining whether a work had recognized stature, a fact-finder could take into account the opinions of artists, art dealers, collectors of fine art, and other persons involved with the creation, appreciation, history, or marketing of artworks of recognized stature. Whether this testimony will carry the day remains to be seen, and we will continue to follow the trial as it unfolds.